Ear infections, also called otitis media, can become severe and cause distress, particularly in infants and children. Infants are more susceptible to ear infections because their auditory canals are more horizontal compared to older children and adults, and this leads to trapped fluids in the ear. Ear infections can be caused by bacterial and viral infections that spread from the nasal passages, sinuses, throat, lungs and other areas. Delicate inner ear structures such as the ear drum may be damaged in severe or prolonged infections, leading to hearing loss. Ear infections also can affect the brain. Due to the proximity, an infection in the ears can gain access to the brain tissues, causing a number of complications. Vertigo or dizziness causes spinning sensation and loss of balance. 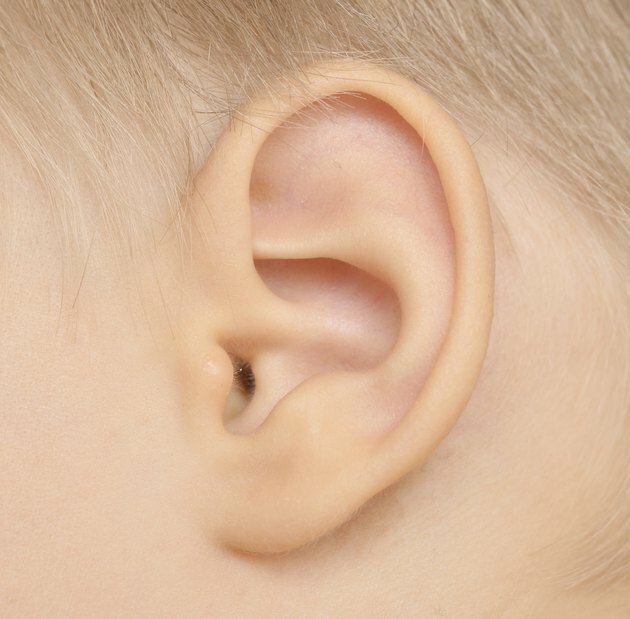 This disorder can be caused by infections in the inner ear, which contains structures such as the semicircular canals that allow the body to perceive motion and body positioning. This information from the inner ear is then carried to the brain by the eighth cranial nerve, which is called the vestibulocochlear nerve. The Merck Manual warns that ear infections can lead to inflammation of this nerve, causing vertigo and loss of balance. The Merck Manual notes that bacterial and viral ear infections in both children and adults can lead to meningitis, an acute inflammation in the covering of the brain. The infection and inflammation can involve the subarachnoid space between the middle layer, called the arachnoid mater, and the thin inner layer, called meninges, that surround the brain and spinal cord. Symptoms of meningitis include a stiff neck, fever and headache. Infants and children may also appear irritable and drowsy and may exhibit little appetite. In severe cases, meningitis can spread to blood vessels in the brain, causing blood clots that can lead to a stroke. The inflammation can also cause damage, swelling and bleeding in the brain tissues. Ear infections that stem from the middle ear can spread to the venous drainage of the brain, causing a brain lesion or abscess. A brain abscess is a localized infection in the brain parenchyma that can develop from a collection of pus to a capsule area of infection in approximately two weeks. A brain abscess is a potentially fatal condition that can lead to death or permanent damage to the brain. Treating ear infections in the early stages with the right antibiotics helps to prevent brain lesions.